For 2018, we’ve put together a beautiful calendar featuring Oregon photography submitted by some of our community members! The standing desk calendar features twelve beautiful local photographs and double-sided month display. 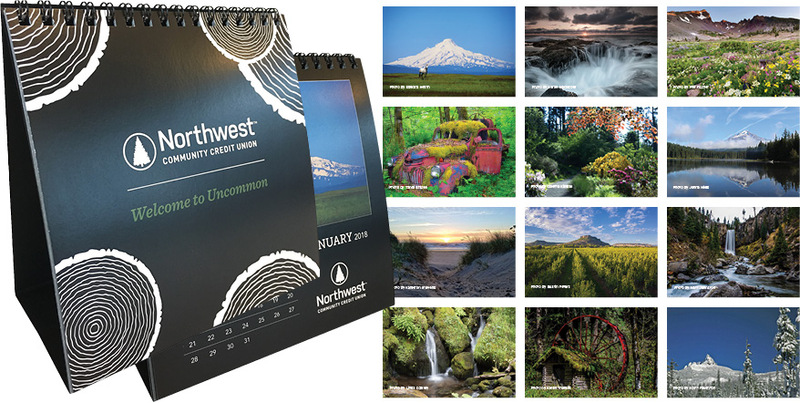 All Northwest Community Credit Union branches will be given a limited amount of calendars, starting Monday, December 4th. Head to any local branch to buy one before they’re sold out! Calendars are $5.00. We’re proud to announce that all proceeds for the calendar will go to the Oregon State Parks Foundation. A huge thank you to everyone who submitted photos for our Uncommonly Oregon Photo Contest! We chose 12 winners, who are featured in the calendar--they received their own copy of the calendar and a yearlong Oregon State Parks pass from the Oregon State Parks Foundation!